The Combined Inversion of Surface and Atmosphere pRoperties (CISAR) algorithm is an advanced mathematical method developed by Rayference for the joint retrieval of surface reflectance and aerosol properties from observations acquired by space-based imagers. 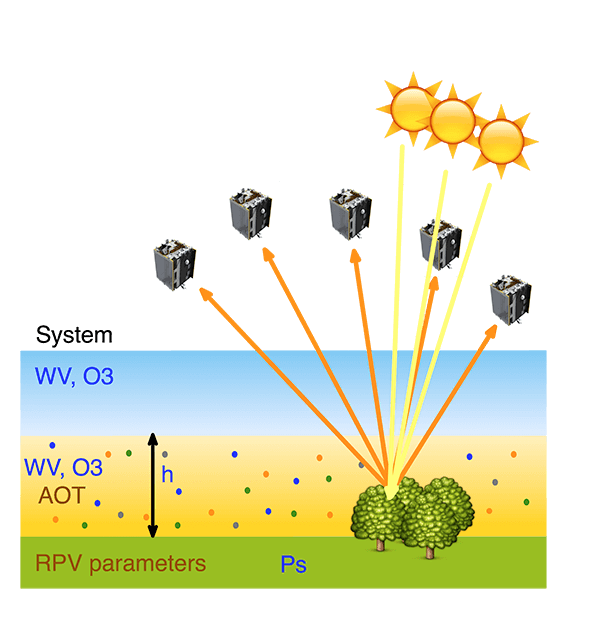 The CISAR algorithm relies on the FASTRE radiative transfer model that describes surface reflectance and atmospheric absorption/scattering processes. The lowest level represents the surface. The lower layer hosts the aerosols. Molecular scattering and absorption are also taking place in that layer which is radiatively coupled with the surface for both the single and the multiple scattering. The upper layer is only subject to molecular absorption. The inversion of the FASTRE model within the CISAR algorithm against sateillite observations provides accurate estimates of the surface reflectance field, aerosol concentration and single scattering properties in each processed spectral band. An estimate of the retrieval uncertainty is also provided. So far, the CISAR algorithm has been applied on MSG/SEVIRI observations in the framework of the ESA Aerosol_cci project to retrieve hourly aerosol properties over land and sea surfaces and on PROBA-V data in the context of the ESA PV-LAC study for the retrieval of surface reflectance. Do not hesitate to contact us for additonal information on the CISAR algorithm.